The pharynx is lined by a thick cornified stratified squamous epithelium. Numerous salivary glands (glandulae pharyngis) are embedded in the underlying lamina propria and tunica submucosa. These glands are mucus-secreting tubular glands, which can also be found in the tongue and the roof and floor of the oral cavity. 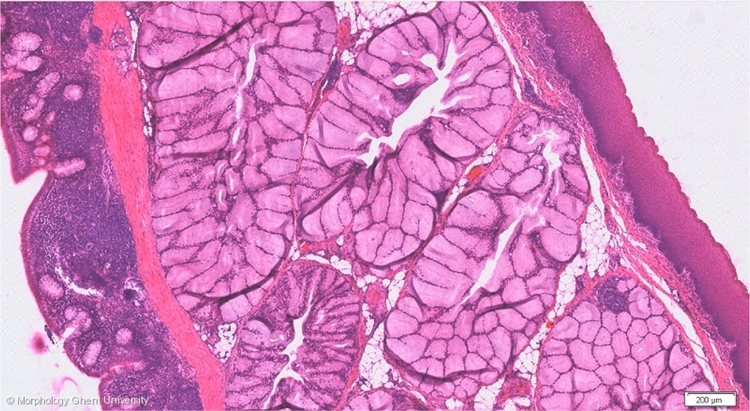 On the micrograph above, left in the picture, the nasal cavity can be seen. It is lined by a respiratory epithelium (pseudostratified columnar epithelium with goblet cells), the connective tissue is strongly infiltrated with lymphocytes and a few mucous glands occur.